The Lymphatic System is a network of blood vessels, nodes and organs which are central to the body’s ability to identify disease causing germs and then destroying them. It works with the blood circulatory system; once blood has delivered oxygen and nutrients to the cells, 90% of it goes back into the circulatory system to be reoxygenated. However 10% of the fluid stays behind and this is called the tissue fluid. Some of the tissue fluid goes back into the bloodstream and the rest is emptied into lymph vessels and is called lymph which is a clear, colourless fluid. Cells carry out metabolism and regeneration and this creates wastes and toxins – it is the tissue fluid that surrounds each and every cell that takes these toxins and then empties it as lymph into the lymphatic vessels. The lymph then empties into lymph vessels which in turn pass through lymph nodes – these are tiny organs which act as filters removing compounds that are foreign to the body. After the lymph nodes have performed their function, the lymph is carried through until it reaches the neck region where it empties into the blood system. The lymphatic system is like the body’s drainage system working to keep fluids in a balanced state within the body. When it does not function correctly, oedema is usually the first sign. The lymph nodes filter out toxins and infection causing bacteria before the lymph is returned to the bloodstream. Without these nodes, infection causing bacteria would be allowed to circulate freely within the body and its tissues. Lymphocytes in the lymph system destroy the infection causing bacteria. Although the circulatory and lymphatic system work together, they have different roles to play with the circulatory system generally nourishing whilst the lymphatic system generally detoxifying the body. The lymphatic system does not have a central pump like the heart – it works because of muscle movement. It has to deal with 3 times the fluid found in the circulatory system and it has to do that without the pumping mechanism and work against gravity. There is an average of between 1 and 2 litres of lymph circulating at any given time. Think of it as waste manager and defender of the body. The lymphatic system is like most things in our bodies – we never generally give it a thought unless something goes wrong. Often it is swellings of the lymph nodes that occurs due to infection. 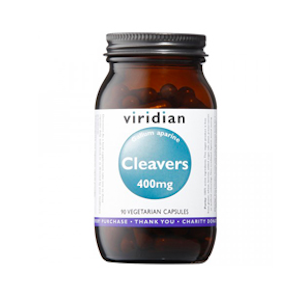 Such an important cleansing system requires some support periodically by using Cleavers also known as sticky weed found in the UK. But what can we take for ensuring our immune system remains at its peak through the winter months? The immune system is unlike any other system within the body with a complex interactions between several glands, lymph nodes, proteins, chemical compounds, hormones and gut bacteria. In the simplest form, specialised white blood cells which know what is foreign to the body engulf pathogens when they enter the body either through skin or the ear, nose or throat. What actually happens when a pathogen enters the body? When a pathogen enters the body, a specific white blood cell creates a unique protein, called an antibody, that locks onto the bacteria or virus. Then the killer white cells, called T lymphocytes, perform their role to eradicate the threat and they also signal other glands involved in the immune system to assist such as the lymphatic system. Dehydration - You would not believe this one would you! Our body primarily works in a water filled environment. Every process takes place in fluids within the body and hence a lack of hydration will hinder these processes. Sleep Disturbances – During sleep there is repair and regeneration of all the systems within the body including the immune system. High Sugar Diets – Sugar destroys white blood cells because its metabolism results in inflammatory compounds. Lack of Exercise – When you exercise, you increase blood supply to every organ and cell ensuring that you nourish the glands and cells. Poor Diet – The immune system places a huge demand for vitamins and minerals – a poor diet will often compromise immunity. Stress – Some stress is unavoidable but ongoing stress can cause the release of chemicals that suppress the white blood cells that destroy the pathogens. Lack of Vitamin D3 – Widespread deficiency is responsible for signalling the white blood cells to attack invading organisms. 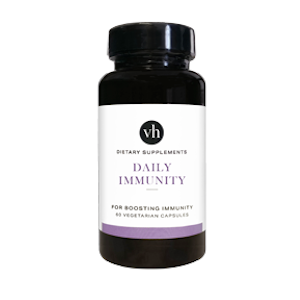 Daily Immunity is the most comprehensive supplement for helping to maintain a healthy immune system and to boost the immune system should you feel that you are going down with an infection. As well as mushroom extracts, olive leaf and vitamin D3, zinc, and vitamin C all combined together to ensure a healthy working of the immune system. Between 25% and 40% of the population will suffer from symptoms of acid reflux. 20% of adults will suffer from GERD which is a severe form of acid reflux or persistent indigestion. Contrary to popular belief, acid reflux symptoms are not often caused by excess acid and in fact these may be caused by a lack of acid. We require stomach acid to break down food so that we can extract nutrients from these. A lack of stomach acid causes improper breakdown, especially of protein rich foods, which can result in the creeping up of the contents of digestion up the oesophagus causing these acid reflux symptoms. Improper function of the sphincter between the stomach and the oesophagus. When it does not close completely, acid can creep upwards causing the symptoms – long term can create damage to the oesophagus and scarring. Since some of the acid has crept upwards, digestive process is altered causing other symptoms such as constipation, slow bowel movement etc. Hiatus Hernia – This is where part of the stomach pushes into the chest through an opening called a hiatus which connects the stomach to the oesophagus. This causes stomach acid, bile and air to enter the oesophagus causing the symptoms of acid reflux. Helicobacter Pylor – This is the most successful pathogen in human history – it has been around for 200 years or more and almost everyone has it with most of us not even realising that we have it. It is passed on by saliva so sharing utensils, drinks etc. It resides in the lining of the stomach and for the majority, no symptoms are noticed. In some cases this infection causes inflammation leading to the erosion of the stomach lining causing peptic ulcers and this ulceration may also occur in the intestine and in the oesophagus. Aging – As we age, we produce less stomach acid – this may be due to overuse of antacids but generally our digestive system ages with us. Obesity – Fat deposition around the mid-riff region puts pressure on the valve and sphincter allowing the release of acid into the oesophagus. Excessive Exercise – Especially running and aerobic high impact exercises with too little rest can result in pressure on the abdominal cavity. The major problem with all these lie in the fact that we still believe this to be due to high acid production when the reverse is usually the case. Antacids – Provide temporary relief but of course the stomach self regulates and increases acid production quickly. H2 Blockers – Work by blocking a substance that encourages acid production. They work slower than antacids but their action is longer. Not ideal because not breaking down food more efficiently especially protein rich foods can result in undigested protein and food putting pressure on the abdomen causing the symptoms of acid reflux to return. The crux of the matter is that all of the above and not without side effects, deplete nutrients within the body due to lowering the acid and increase the risk factors for other disease. 1/ Chew Your Food Thoroughly – We spoke about this earlier in the year – 12 to 15 times is a good guideline. Chewing tells your brain that its time to digest and this is the number one culprit for acid reflux. Chew thoroughly, put your fork down in between each bite and enjoy your food. 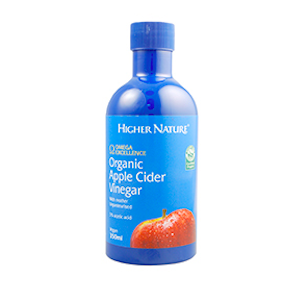 May help control cholesterol – because it contains apple pectin – a soluble fibre known to reduce circulating cholesterol. Slows the digestion of starch – starch is converted into sugar – sugar destroys all proteins in the body which is why it is considered toxic when taken in excess amounts. This digestion of starch means less sugar in the bloodstream which means less likelihood of developing sugar related diseases. Numerous topical uses from hair rinses, gargles and even direct application to warts. 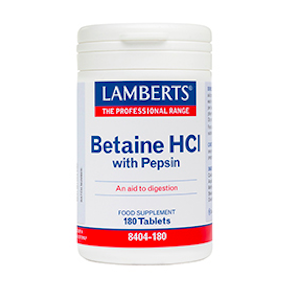 4/ Use Betaine HCl – Betaine hydrochloride with pepsin is a supplement that alongside ACV works to increase the stomach acid levels. Pepsin is an enzyme normally released by the stomach which helps break down proteins in food more effectively – this is important because often people don’t eat lean meats and the improper breakdown of a high protein meal is more likely to cause acid reflux and acidic stomach sensations. 5/ Use a Quality Digestive Enzymes Supplement – So the stomach has started the breakdown of food by using Betaine HCl but the food still needs to be continued to be broken which is where the Enhanced Super Digestive Enzymes come into play. A word of caution, these contain traces and only possible traces of dairy, wheat and soya so if you are highly sensitive to these then please use Vegan Digestive Enzymes which are free from these. Do not overeat – smaller meals allows food to be digested more efficiently and also does not put pressure on the sphincter between stomach and the oesophagus. Do not drink too much water – stay hydrated but not overly hydrated again due to pressure on the stomach. If your symptoms of acid reflux continue for more than a few weeks, please consult your GP. Liquids are rapidly absorbed into the bloodstream since the active is almost “pre-digested”. Some people simply cannot swallow whilst others may be taking a lot of tablets and capsules which can put a burden on the digestive system. Some people have less than optimal working digestion often due to a lack of digestive enzymes which results in bloating, constipation and other digestive concerns. For these people a liquid does not really require digestion to the degree that a tablet or capsule would so the liquid is gentle on the digestive system. Many people have digestive concerns especially inflammatory bowel concerns such as IBS, colitis etc. In areas of the gut where there is inflammation, absorption is poor so taking a liquid form is more likely to be absorbed. A complex molecule found in the humic layer of soil some 15 feet below the ground. It cannot be manufactured in a laboratory! It holds 65+ minerals including trace minerals. These minerals are in their ionic form so are easily absorbed into the tissues and cells. A catalyst to speed up reactions within the body from digestion through to nerve function. At normal body temperature, these reactions take place slowly and fulvic speeds this reaction. 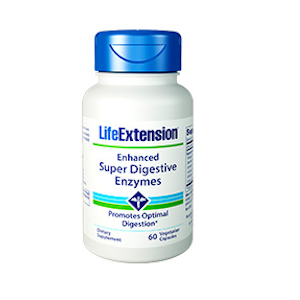 Activates our digestive enzymes so we can extract nutrients from the food we eat. Chelating agent to remove heavy metals – we are conscious of cleaning our bodies externally but not many people worry about internal cleansing. Encourages oxygenation of all tissues which in turn helps enhance energy. Iron Deficiency – One of the most prevalent mineral deficiencies in the world. 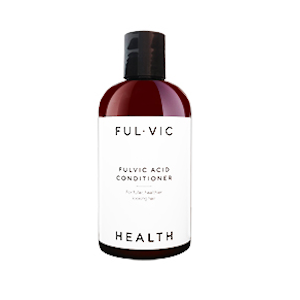 Fulvic acid primes the iron into its ionic form so it can help to tackle any deficiency. 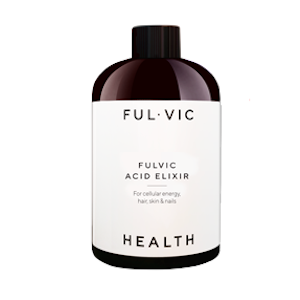 People taking Fulvic Acid have reported greater feelings of vitality, improved energy, a stronger immune system and a higher tolerance to stress. 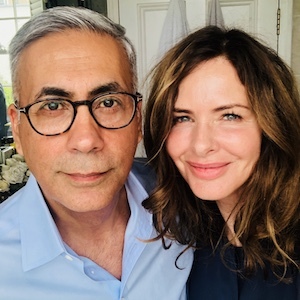 These hair products are not just aimed at thinning hair and hair loss – they work to ensure the health of the scalp and hair and so everyone can use them whether you have oily hair, dandruff prone hair or dry, damaged hair. 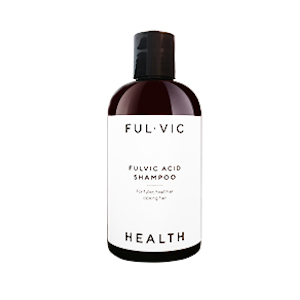 Fulvic Acid - Nourishes the scalp follicles with 65+ minerals including trace minerals. Aloe Vera Chamomile and Calendula - Work to calm down underlying inflammation which causes disturbed signals of keratin production – this inflammation (not always visible) causes hair loss and may also be responsible for dull looking hair. Horsetail - Used for its silica content which is known to strengthen hair. B Vitamins from Hops and Goldenseal especially biotin which is the most studied nutrient to nourish the scalp. Similar to shampoo but also contains amino acids to help healthy keratin production of which hair is made of – leave on scalp for a few minutes to allow these to work effectively. But amino acids are not just for keratin production. 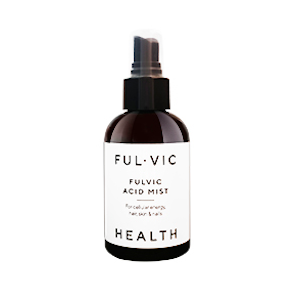 This is the hero product – it is a leave in treatment spray to be used overnight that delivers fulvic acid and its actives to the maximum degree. Marine Collagen - Rich in keratin producing amino acids such as proline – incidentally marine collagen is much smaller in size than bovine collagen. Butchers Broom - Increases localised circulation to ensure healthy delivery of oxygen and nutrients from within. 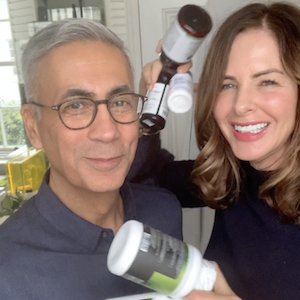 Multiple Peptides – To promote growth factors and repair – this is a plus point because this product is not just aimed at hair – it can be used all over the face and body too.